Like parents standing on the porch waiting to see their children off to their first day of school we waited for what comes next in a release to production. Among our children: The C116 ($49 Sinclair killer), the C264 ($79 office computer), and the V364 – The computer with an interactive desktop that could speak (courtesy of [John Fegans] who gave us the lion’s share of what made the C64 software great). Something happened then, and by something I mean nothing. Nothing happened. We waited to assist in production builds and stood ready to make engineering change notices, and yet nothing happened. It was around this time that [Mr. Jack Tramiel] had left the company, I know why he left but I can’t tell due to a promise I made. Sadly, without [Tramiel’s] vision and direction the new product releases pretty much stopped. What happens when Marketing tries to design a computer: a TED in a C64 case known as a C16. Meanwhile in Marketing, someone came up with the idea to make the C264 more expensive so that they could then sell it for a prohibitively high price in. They changed the name, they told us to add chips, and they added software that (at best) wasn’t of interest to the users at that price. They wanted another C64, after all it had previously been the source of some success. Meanwhile the C116 and the V364 prototypes slowly melded into the random storage of a busy R&D lab. 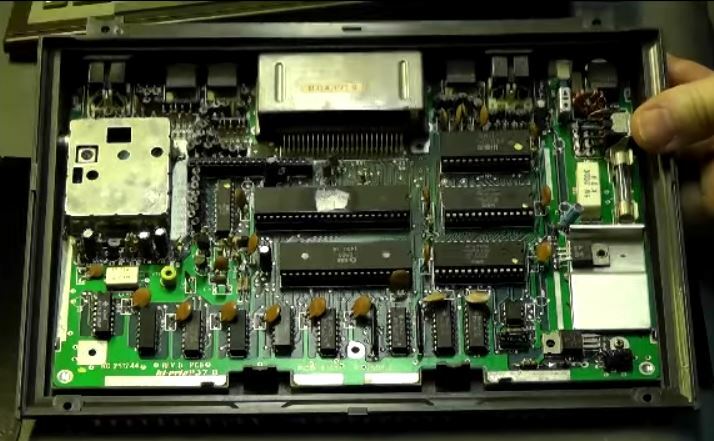 We literally didn’t notice what had happened; we were too busy arguing against abominations such as the C16 — a “creation” brought about by a shoving a TED board into a C64 case (the term inbred came to mind at the time). The inside of a c116, a $49 computer with 121 colors and sound. With the passing of Winter and the final sign-off by FCC we found the time to catch up on our hygiene and start to think about what to do next. Within a relatively short period we started to re-coagulate into functioning groups and were running the gauntlet again with the new pair of machines; the Commodore LCD and the C128. The LCD and C128 were mostly for short field gains and the hail-Mary of the Amiga which was believed to be a company saver if marketed correctly. Time passed and we never really asked what happened to “Talking TED” as rumors of another office closing abounded and the numbness of 18 hour days created so much tunnel vision that it became hard to remember anything else, like where you parked. My car actually sat in the lot for 3 months and was towed subsequently away after the snow melted. Doubt and faded velum are all that’s left of this moment in time from almost two generations ago. For me the Early 1980s at Commodore Business Machines was Camelot. The role of Merlin was played by our brilliant chip designers, our quests many and fruitful as we dutifully searched for the Holy Grail of home computing. I had entered as a squire and came out a knight with no visible scars and one heck of a story. Near the end we grabbed a child off the street, (or was it a technician in QA?) and — like in the Camelot musical — told him to ride from town to town telling the story of Commodore. This was a company that at one time had offices circling the world; the sun never set on Commodore. A few years ago I ran into [Chris Liendo] from the New York Times at Vintage Computer Festival East. I know my jaw dropped, I felt my tongue drying out. I had not seen this picture nor did I know of its existence. 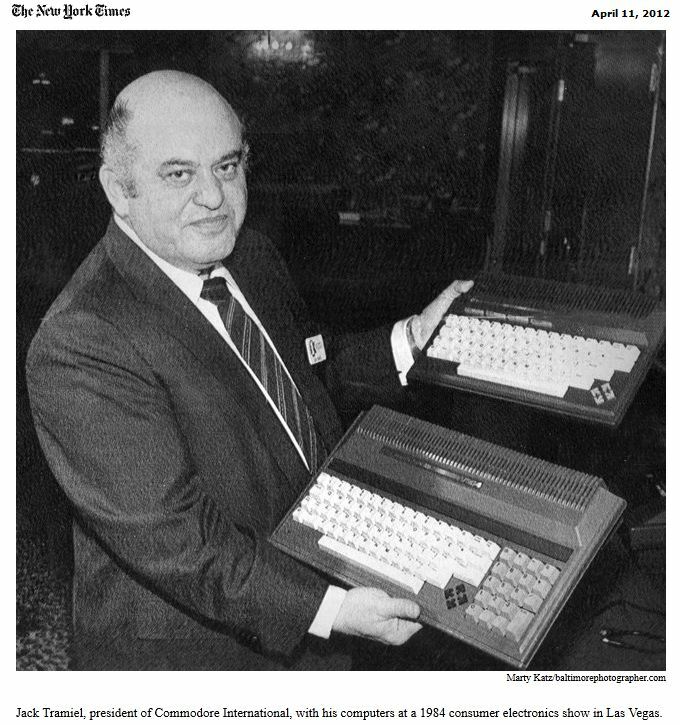 Right there in the late [Jack Tramiel’s] hands is proof that my memory wasn’t just about a rouge prototype in the R&D lab, this was the culmination of many departments and several offices. It was our group that put those computers in [Mr. Tramiel’s] hands. These are among a very few hand-crafted units ever brought into existence. Sometime last year I found a PCB in my collection, one that I actually didn’t readily identify for a score of milliseconds… it had open ROM sockets, it had a TED chip, it had a speech chip… it was a V364 PCB. I had no interest in turning it on or fixing it as it was a relic and placeholder for machines that I had seen working long ago. We old engineers make lousy collectors, we toss the boards and occasionally break pins and toss them in the air while talking. If we are talking to collectors at the time we toss them even higher. Jump forward to this year’s Vintage Computer Festival East. I knew there was one collector who would be there that relished the TED line of computers more than any of the other festival-goers. He had gone as far as writing some pretty capable diagnostics for TED. I knew he would be a good custodian. A deal was done and [Rob Clarke] returned to Switzerland, the new owner of a rare v364 mainboard. How strange that with all of the things I remember from that era, I had forgotten that TED was a she, not a he. First computer I had and I loved it. Much better keyboard layout then the 64. The C64 was a game machine that happened to have some decent hardware and was so open that you could literally do anything with it, including office work. Anyone recalls Multiplan for the C64, a stone age spreadsheed by Microsoft? If it wasn’t for late management that destroyed everything great the techies made, C= could have filled the Apple niche years before and Apple would be out of business since the late 90s. I always wondered how Apple even made it through the market when the most significant thing the made was BASIC. Everything else they did was a redressing of what was already out there. They still use that same business model. Sadly, it seems that they really don’t have actual EEs, they just have mostly marketing gurus. What a sad state in innovation. Way unfair. Really the Apple II was very open at the time. The original Mac offered 3 1/2 inch drives when the majority of people used 5 1/4 inch. The UI was very different from anything that was not a workstation class machine. Apple actually bought Applesoft BASIC (the one that was on most Apple II’s) from Microsoft. But what they did innovate was in graphics. Of the three personal computers introduced in 1977, only the Apple II had color graphics. It was also the most expandable. Neither the PET nor the TRS-80 had expansion slots. They were also the first to deliver a (relatively) cheap floppy disk solution. No, Wozniak designed the Apple 1 and ii to be hacker friendly. For what it cost, and compared to what else was available at the time, they were very different. He would have just given his designs away if Jobs had not co-opted him. If it was up to Woz, every apply computer ever made would have been expandable and open. Allegedly Jobs wanted Wozniak to write their own BASIC for the Apple ii, but he never did. The apple 2 kept apple afloat well into the early Mac days, when the Macs were way under powered for the resource intensive OS they were running. Oh, the C64 was great too. Used to love playing Mercenary: Escape From Targ. That game blew my mind. Tandy color here, but it was mine in 1988. It was more than a little outdated then. trs-80 model 1. I made that machine do some of the coolest things using BASIC and Assembly. TI 99/4A, used the “Teach Yourself BASIC” books and cassettes to teach myself BASIC! TI 99/4A for me, too! The program to store BASIC programs to cassette is smaller than the one needed to load programs back from the cassette. Can you guess what that means? One really upset ~11 year old. I bought a Timex-Sinclair Kit when they were $99, and then added a Memotek 32k memory pack. Still have them.Got it for the same reason, learn BASIC and then passed a CLEP exam for 3 credits. I followed it with a C-64, used it to get through college. Later paid $1200 for a single floppy XT machine. Wrote a program to solve a differential equation that took an hour to run. Added “beep” commands so I knew it was running. It was fun being part of those early days. Same here with the trs-80, though, now that I think on it, I can’t remember if it was perhaps the (Burroughs) B20. Now that was a sweet machine – need more [ram/diskdrives/harddrive/whatever]? Just add on the component! Brilliant. I started with the TRS-80 too. Found out how to program in z80 first but typing in all the basic from mags I found out how to do basic too. Then my friend got a C64 for $200. I paid half and he left me keep it because did not want to tell his mom and dad he paid that much for it. He was going to pay me back. But I seen how good it was better then the TRS-80 and paid him the $100. Got a $50 tape player hated all that time typing in and can’t save it. After some time went to a store and got a $300 1541 disk drive and it took off from there. Had a TI 99/4A when they went on sale in 1983 (I think). My first microcomputer was a Netronics (Cosmac) ELFII with a 4K Ram board, home built sound card and some rudimentary I/O. It had black & white video and a Hex Keyboard for programming in machine language. I’m still a fan of that processor (RCA 1802). I really wanted a TRS80 in the late 70’s, early 80’s. Unknown to me my dad bought one and kept it at his office. He never shared that info with the family. I only found out while talking to him about vintage computers over lunch one day. I would have been pissed if I had known that when I was a kid. LOL. I think that had the VIC 20 not showed there was a capability and a market that there may not have been a C64. The VIC 20 also had less RF emissions and so was a favorite of HAM operators. Is this really doing synthesis or is it like the Intellivision, Odyssey^2 and others that only played back digitized words and a bunch of phonems to make words? I’m that Chris and I was ecstatic to make you happy for once. You keep coming to the show and sharing your knowledge and stories and we appreciate it a lot. If I put a smile on your face for once then its great. Hi Chris! I added your last name to the post, I could’t find you car in time for the due date. Yeah the picture blew me away as there was proof that the V364 existed in real life. I remember. Sorry I missed VCF this year, I would have enjoyed to see you again. Take care and all the best. The number of forgotten home computer protoypes from the ’80s and ’90s lurking in attics must be rather high. I know there are several (including a 1995 tablet computer – admittedly 6 D-cells means it’s a bit heavier than an iPad) in mine. I think you’ll find most around here would love to see you pull out those prototypes and get them working again (document it when you do). As far as the heft of the hardware, the original iPad isn’t exactly light as a feather. I stilll think for what they could do the “vintage” machines aren’t all that big or heavy. I think he’d find that a lot of us in the emulation community – specifically MESS – would love to see these prototypes un-mothballed as well, and hopefully to have their firmware ROMs dumped so that they can be preserved through emulation well after the hardware itself has bit-rotten away. The 1980’s was the decade of “for future use” or “for future expansion”. Almost every microcomputer of the era had a port or something labeled as such – for a future use that never happened. My first computer was a Commodore +4. I owned it for almost 24 hours before exchanging it and purchasing a C64. None of the software that was out at the time supported it, and many of the ports where hardware “connector” incompatible. In spite of this, had it contained a C64 mode like the 128 did, it would be have a sucess! The built-in software worked well, and the keyboard was a improvement. regarding the keyboard; its clear too see how much closer it is to current standard layouts. The arrow keys, function keys, and num pad all taking their places. I wonder if anyone has charted the evolution of keyboards since the typewriter. My condolences. >:) However if you had gotten that for $79 or $99 it would have been a lot easier to live with the differences. Also since we were beating on the “Plus 4” version we slipped a real UART in just so it wouldn’t be “all bad”. BTW Jeff, I went to my first CES, heard stories like yours only from the developers, and went back and penned a memo called “Yes Virginia there is Compatibility”. This was before we had spellcheck capabilities on the Vax so it was ripe with spelling errors, you could just smell the “animal” coming off that memo. When we started the C128 we then had to put our mouths where our memos had been or something like that. I am told that when the shareholders sued CBM a few years later that the memo came up and had the lawyers laughing… and then someone had to explain what a C128 animal was. I may be in a minority here, but I liked the C16. Expanded to 64KB it was, in some respects, better than the C64. TED had more colors, hardware cursor, hardware reverse (meaning less space neded for the char set in ROM) and writable X and Y counters (ask a demo programmer what you can do with those). The BASIC 3.5 was much better if you wanted to program in BASIC (And you had more RAM, 60671 Bytes free!) including the much better garbage collection for strings (compared to Basic V2) and it came with a usable hex monitor that even included a simple assembler/disassembler. That’s the kind of ROM the C64 should have had from the beginning. The reason why I like the C16 especially is that the keyboard was good, IMHO much better than the one of the Plus/4. Also, you had space inside the case for extras and better cooling (something that TED and the CPU _really_ need). I still have a few C16 (64K) and one Plus/4, all in working condition and with the biggest problems fixed (heatsinks for TED and CPU plus the hot 7805 right next to TED and CPU in the C16 replaced by a switching regulator). 27C128 instead of the mask ROMs reduce the heat inside the case further. And yes, most of the games were not as good as on the C64 of course, but there are some gems or good ports. I ‘wasted’ many an afternoon with ‘Mercenary’ and ‘Second City’ and ‘P.O.D.’ was just as much fun on the C16 as on a C64. For what it was intended for, being a competitor for the ZX spectrum, the 264 series is quite good. But the arrow keys man! The arrow keys! Given that the moulds for the C64 case already existed, was the cost of the C16 really that much higher than the C116 would have been? Or was it more an issue of muddying the water as to where this machine sat in the marketplace? Not only was the case dirt cheap even by CBM standards, but the PCB was single sides with wire jumpers. At that point my “step children” had grown to around 8 including things like 232’s, etc. And the water was very muddy, very very muddy. Uhm, the C16 and C116 PCBs are double sided. You might be refering to the C16 keyboard PCB, that one is indeed single sided with jumper wires. The speech synthesis sounds remarkable clean. But can it sing, like SAM on the C64, or is it just a fixed number of words instead of a phoneme system? I wonder when/if this will get added to MESS? DATA WELT: One very important question bothers us: Why did you leave Commodore? Is there a simple answer to this question? Jack Tramiel: If you asked the people I worked with, they will tell you that I practically did not change in 25 years. I was always one of them. Just because we were a million-dollar company, we had not have to spend money like a billion-dollar one. Because if you spend more money, you have to adjust prices. The man I worked for was of another opinion. As soon as the business was going well, he wanted to spend more money. That was one of the points where we had different opinions. And so was the question of financing. I was of the opinion that we should had gave away more shares as soon as they were well-traded, moreover because we did never had a raise of stock since we went to stock market 1962. With the 120 million dollar we would have earned by giving away 2 million new shares we could have paid back all debts we had at the banks and by that strengthen the companies position. The man I worked for was of the opinion that this would weaken his share of the company and cut his influence – which was totally wrong. Those two were the main aspects. To come to terms: our philosophies have been too different. We came to that point when I said, that I will have to quit if I cannot do what I think would be best for the company. He said very kindly that if I will not do what he wants to do, then I could leave. And so I left. I had a C128 – because my dad also needed to use it for business – but I used it almost exclusively in C64 mode. I bought an Amiga when I was around 17 and started learning to program it, but I just never had the connection with it that I did to the C64/C128… I don’t know if it was because programming “demo” type tricks on the Amiga were just too easy (having so much built into the hardware). I think I enjoyed the challenge of squeezing cycles out of an older computer and making it do things that weren’t supposed to be possible. I ended up selling the Amiga and dropping out of computers altogether for 5 years. What I bet has caused the failure of many electronics products is shows like the Consumer Electronics Show, E3 and other trade shows don’t allow actual consumers in the doors. They are for companies to show off their stuff to the media, and to get a spy eye on what the competition is doing. For example the kitchen appliance show. You’d think they would want to have huge numbers of people who like to cook at home to attend and ooh and ahh over all the latest knives and blenders, or tell them their bass-o-matic 76 is a crock of sour milk. Nope. It’s a self back-patting and showing off to the media deal. I suspect there’s a lot of “Well, crap. Someone beat us to *that* concept!” that happens at trade shows. The closest trade shows get to having consumers attend are the buyers for big stores like Wal-Mart, Amazon.com etc. But those people have to make bets on what they think the end users will want. I think it would work out far better for the average joe to attend and the retail buyers to skulk around listening to what real consumers think of the new goodies. I did C64 Logo and put it on the C16 and the 264. One of my associates kept calling it the Tad instead of the Ted. Logo came in a ROM cartridge for the 264 (plus 4) and I heard they made 50,000 of them but of course never sold them. Somewhere I have one. Andy Finkel told me that they couldn’t call it the Plus 4 because “Plus 4’s” were a kind of Bermuda shorts type apparel and they felt the trademark wasn’t available.